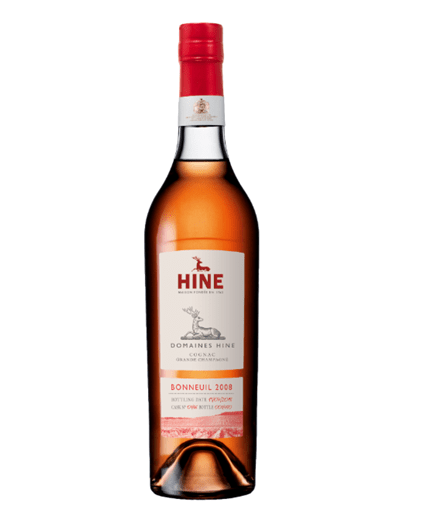 Hine’s Bonneuil 2005 and 2006 — limited edition, single estate Cognac releases named after Hine’s 297 estate-managed acres at Bonneuil Village — are some of the finest middle-aged Cognacs you can find. The Bonneuil line skipped 2007, but now it’s back with a 2008 vintage release composed of just 16 casks, the smallest release in the line to date. In contrast to both prior vintages, Bonneuil 2008 is a more masculine expression of brandy from the distillery. Even the nose seems more powerful, offering notes of citrus oil, jasmine, cedar box, and fragrant incense. The palate is sharp and immediately impactful, showcasing golden raisins, apricots, and plump oranges, but cut with a significant amount of spice, tempering the sweeter elements in the brandy. The finish feels a bit woody, with a nod to that cedar box and some sandalwood, but with a grind or two of white pepper adding some heat. Toasty and spicy, it’s a sidestep away from the rather elegant 2006, although its complexity and surprising balance give it plenty of charms of its own.